Ascalon Westminster Bench: The Ascalon Westminster Bench is an attractive classic garden bench with decorative seat back, firm seating, and curved arm rests. With its spiral detailing and bold lines, the Westminster is a beautiful bench from Ascalon's Heritage range or antique-effect garden furniture, and is finished in 'grey stone' colour. A strong and supportive bench, the Westminster is made from steel and is powder coated to ensure long life outdoors. Its 107cm width offer ample space for relaxing outdoors and enjoying your garden, and will comfortably seat two people. A very attractive garden bench, the Westminster is a great piece of steel garden furniture that is sure to last many years of frequent use. 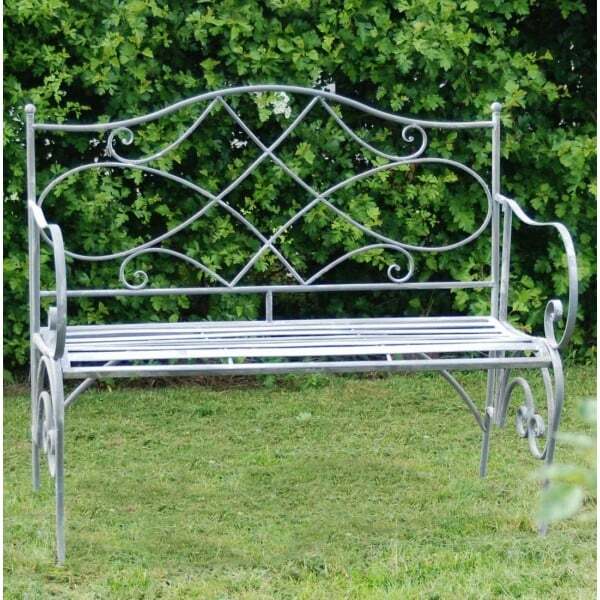 Delivered pre-assembled, this metal garden bench requires no further assembly and can be easily folded to move or store away.